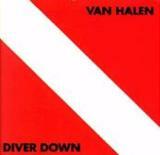 After the quite dark and moody Fair Warning, Van Halen lightened up again for their fifth studio offering, Diver Down. Besides being the most pop-influenced record to date for the band, Diver Down also was pretty cover-heavy (5 songs out of 12) and with many instrumentals included. This all resulted in the most uneven album had made since the beginning. Following on the trails of You Really Got Me, another cover from The Kinks´ catalogue, Where Have All The Good Times Gone, starts the album with an OK mid-tempo rocker. Despite Eddies superb, raunchy guitar tone that delivers the nice riffs, and Roths signature animal-howls, the album doesn’t really pick up until the second speed-riff-piece Hang ´Em High. A very nice, fast rock tune that could hold its own against the best of any band. The middle of the album is then cluttered with some awfully mediocre songs, like the slow-plodding lounge-like Secrets and the awfully unmemorable instrumental Intruder. The instrumental Cathedral is pretty good with its atmospheric chord progressions and the covers of Dancing In The Streets and Roy Orbisons 60s hit (Oh) Pretty Woman are good at best, but pale even in the light of the best tunes on this album. Little Guitars picks the albums high pace again with a stupendously melodic classical guitar intro and then firing off to a great party-number. Big Bad Bill (Is Sweet William Now) keeps on the marvellous reputation that Van Halen had made on earlier records with acoustic-based blues numbers (Ice Cream Man or Could This Be Magic?, anyone?). The Full Bug finds Eddie scorching his axe again like a genuine demon on this very good, bluesy rocker. The album is rounded up by a personal favourite of mine, the completely-acapella-sung stage-show-tune Happy Trails, that shows again just how well these guys could sing in harmony. Even though at times it sounds like the band (or at least Roth) had chugged down a few kegs before this particular recording, but its all good. It sounds great and it works, what else is required? The production is top-notch and leaves nothing to be desired for, as usually it is with VH.